Sometimes people turn cars into artwork for a good cause—like when Cadillac Ranch gets a new coat of paint to inspire people to become blood and organ donors. Other times, cars get turned into “art” seemingly for the sole purpose of terrifying one’s eyeballs—like this neon nightmare. 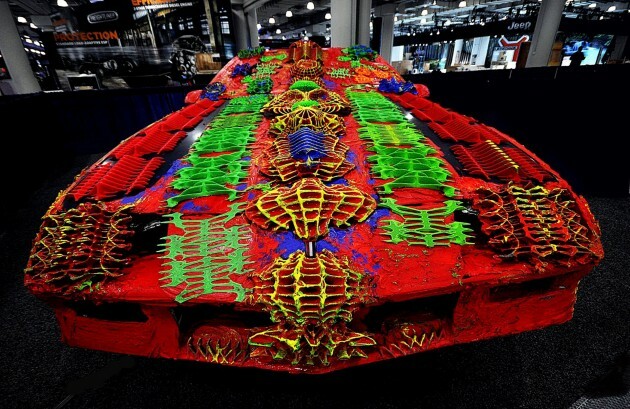 Artist Ioan Florea 3D-printed this piece of “car art” live at the 2015 New York International Auto Show. It’s basically just a 1983 Camaro Z/28 covered in brightly colored plastic and resin, and looks like the kind of ride that even Isaac Hayes’ character in Escape from New York would call “a little over the top,” but Florea sees much deeper implications in his creation. So, basically, he took a working classic Camaro and made it both undrivable and ugly. And probably got a lot of money and exposure for doing so. Huh. The project used two 3D-printers, and after it was finished, attendees were invite to touch the work.